Status: offline Ok, got the counter mod down loaded and OMG it works and in the hands of a luddite like me cutting and pasting can be a challenge. I have waited over 30 years for this. If someone wants to do a kick-starter for Richie61, I will donate $100.00 as a gift in appreciation for his work. 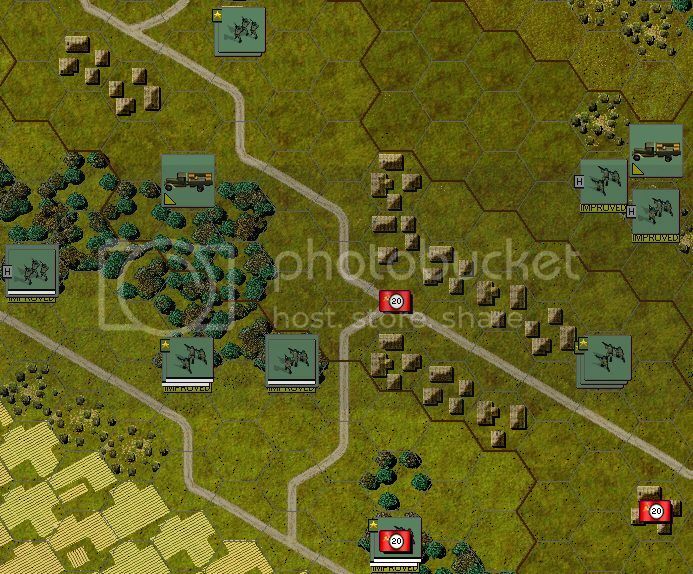 And maybe he can give us U.S. Marines and Japanese infantry counters. Ok, strike all that I do not want Richie to get in trouble with the designer-publisher of Tigers like IronX did with Tiller Software over Squad Battles mods. I suppose my thanks will have to suffice. I am no Andrew (Iron X). He was a true mastermind of Squad Battles. Map making, mods etc! He was before my time. I do a few SB mods at times. Status: offline Just amazing "Squad Battle" MODS!! 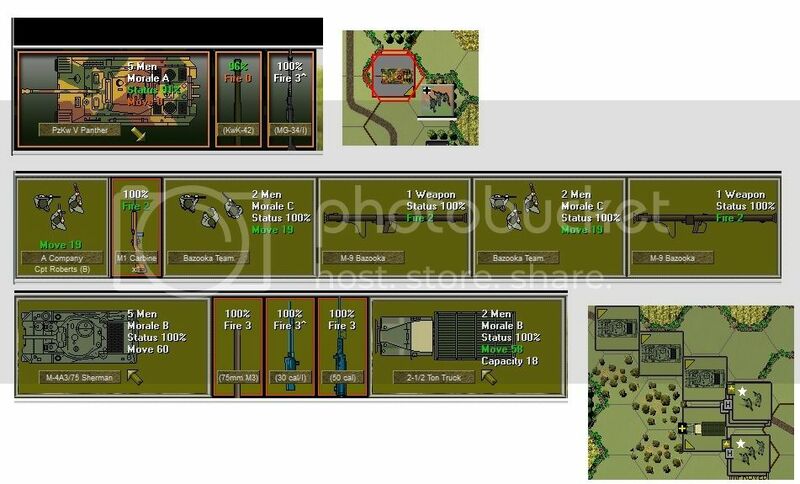 Status: offline Are those Panzer Grenadier German Infantry that I see Richie? Now wer are talking! I prefer the 3/4 view of both the squads and the vehicles. Status: offline They look the biz. Skills! Status: offline Thanks for this. Now we just need Peter to add the snow rules in an expansion. Status: offline Snow Mod is well appreciated. Great work! Status: offline This looks superb. I look forward to test driving it. Cheers. Status: offline Très bien fait! Merci mille fois! 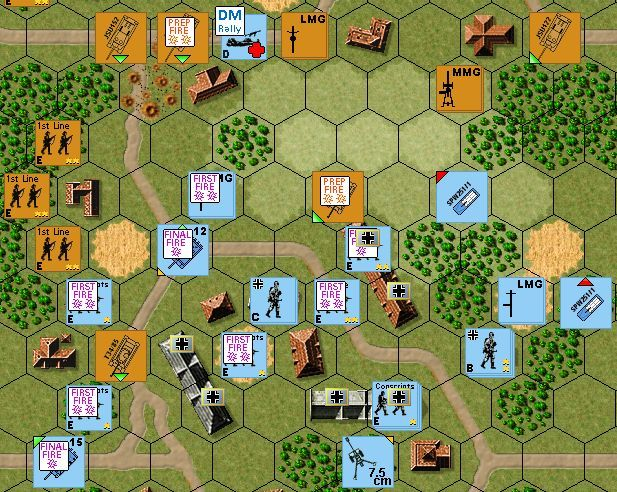 Status: offline Please see the attached "Squad Leader" version 2 mod with small counters and Peter's terrain for Tigers On The Hunt. I also add MP numbers to the vehicles. 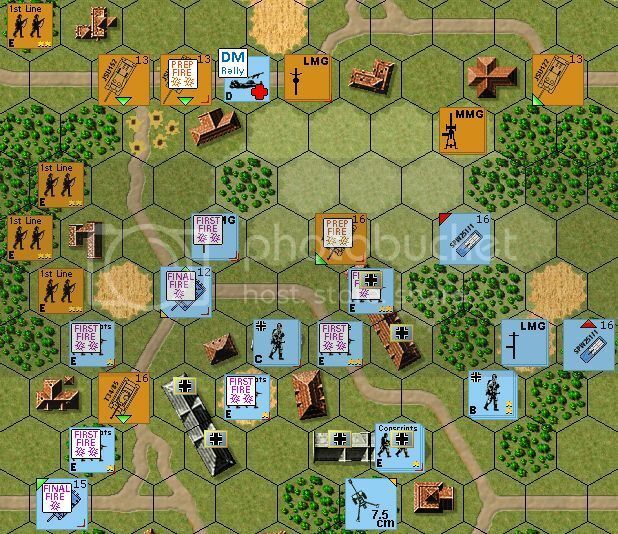 Please see the attached "Squad Leader" version 2 mod with small counters and Peter's terrain for Tigers On The Hunt. Wow this is really cool!! I may have to switch to this new MOD now. I have been using the "Colorful" MOD because I really like the Graphic Counters Acropa created for the game. Status: offline Man what a great community we have here and its only going to get better. Thanks for the updated Mod RICHIE61. 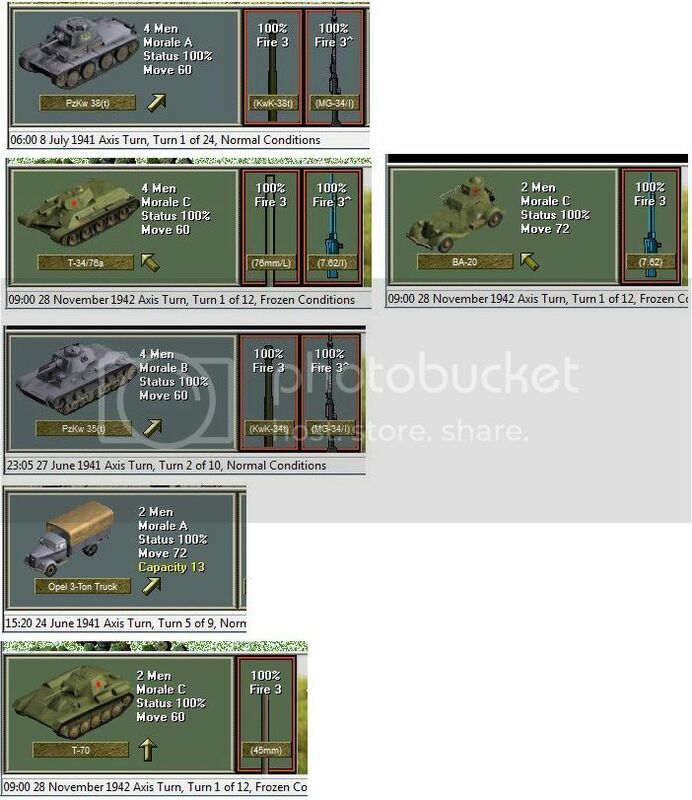 I don't find in ASL Armory information for used by SS AFV : PzKpfw 35t#, PzKpfw38(t)A, Marder III(t)M, StuIG 33, Spw250/10 & Ordonance : sIG33 so i leave in Blue Grey. the Base Mod is always my best VASL from JMass, counter extrmely inspired by VASL module. Richie61 any way to get those counters for Squad Battles you showed there in the first set of screenshots? I just recently picked up ES and RV and would love to use those counters. BTW I also picked up this game tonight due to all the great work you guys have done already with the modding and to support the developers passion. I cant wait to see where this game goes. I have always wanted to get into SL/ASL but never had the chance so this is close enough for me. Status: offline I have a question. Can you save more than one Mod in a folder? For example desert and snow and if so how do you get the game to select one over the standard file?